Do you remember when I did a post on my favorite Etsy shops? Well, one of the shops I featured, Embellished Living, has kindly offered to do a giveaway for one of you to win a set of personalized tile coasters AND has also provided a coupon code for 10% off (enter: KEEPCALM10) your order, for those who would prefer not to enter the giveaway and shop now! You can personalize them any way you'd like. Not married? Use your initials or another important date! +Pin your favorite item from your shop on one of your Pinterest boards (leave me the link below) OR leave a comment telling me how you would personalize your coasters!! You pick! **Please leave a separate comment for each entry. Giveaway will be open until this Friday and winner will be notified on here and via email. Please make sure you leave a valid email address so I can contact you if you are the winner! Good luck! I love this store ever since you did a post about it last week! I am getting married this September and would LOVE to have these in our new home we are moving to next month. Made Embellished Living one of my faves on Etsy! Last comment- I would love to give these to my best friend for her upcoming wedding! I favorited the shop! So cute for my upcoming wedding. I added their shop as my favorites on etsy! I added her shop on etsy! I would customize my coasters with my name, my husband's name, and our two puppies names!!! I added them to favorites on Etsy! I think I would actually give this as a gift to my sister. She got married in September so it would be a cute anniversary gift for them. I favorited Embellished Living on Etsy! I "liked" Embellished Living on Facebook! I "liked" KC&CO on Facebook! I'd get our 4 intials: J, S, I and S.
They're my fave on Etsy! I followed on instagram, too! I liked Embellished Living on facebook! I would get them personalized for my besties wedding shower in May! She's getting hitched in June! So cute! I added them to my favs! Added Embellished Living as a favorite on your Etsy account! If I am picked I would personalize the coaster for my wedding that is in a few months. D&L 6/23/13 or Mr and Mrs F 6/23/13! Too many good options! I would personalize our coastera with two of our last name, our dogs name, wedding date! I personalized three sets of coasters for wedding gifts. Love them! I would get coasters similar to yours, with our wedding date and maybe our names. I would customize my coasters for friends of mine who just got married. I have been looking for something special for them recently and this is it! I have found it. I added Embellished Living to my Etsy account. I liked Embellished Living on Facebook. I added Embellished Living as a fave on Etsy. 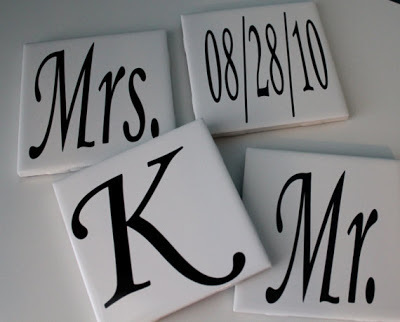 And I would probably personalize my coasters exactly as you did but with 7/12/08...Our last name's initial is 'K'! Already follow on Facebook under "Life, Love & Puppy Paws"
Katie, thanks again for featuring our shop. We're still getting periodic hits from your blog, a year later!